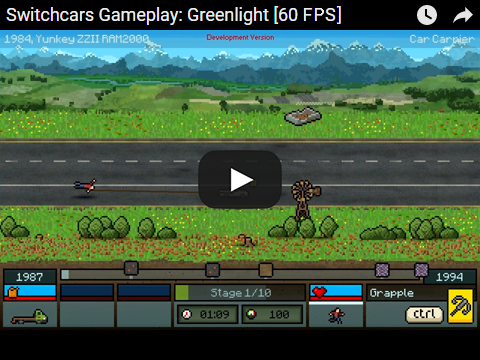 Switchcars is currently in late alpha Early Access, over three years into development. More media on the website. 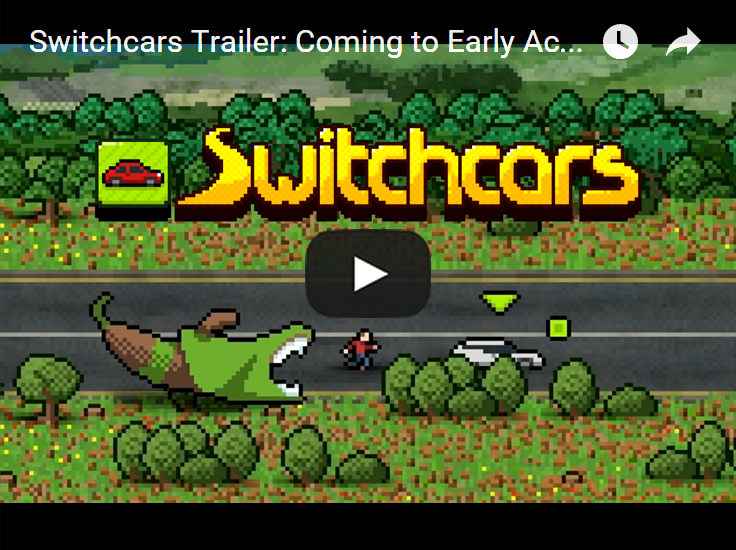 I'd like to show you a game I'm making, called Switchcars, an action roguelike-like sidescroller. 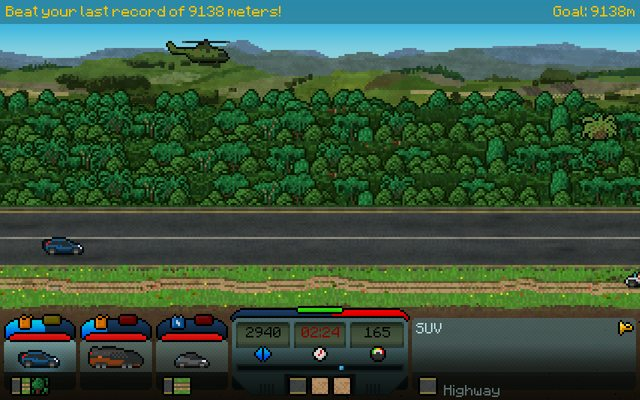 You try to escape horrible aliens by using any of 1000 vehicles you can stumble upon. By going really fast you're saving some time that can be spent collecting resources. Environments are procedural. You need to survive an alien invasion by building and manning a survivor camp. If aliens do catch up, you'll have to fight them. I've been solely working on it for about a year and a half, and this is the first time I'm showing it to the public, except for a few events and meetups. It's still early in progress though, so some of the mentioned features are missing. Currently the game is about moving as fast as possible and beating the clock. At this stage I am hoping to find serious partners to further develop the project together. There's more information in the video description and on my blog. Post some screenshots. Most dont click on links without having any expectations. Dont know why I did here. I dont regret. Thanks nikolaus! I wanted to add some, but I couldn't resize them here (they were too large). I'll add smaller ones then. After watching the video, this just looks great! Thank you guys! Added a gif to OP. Much better indeed. Ha really cool Idea, and really nice artwork. So is there an end game? or just a high score mechanism? So is there an end game? or just a high score mechanism? If we're talking about the final version of the game, there will be a true end game, yes. The whole adventure is basically a hierarchical system of needs. Every day, aliens will become more dangerous, increasing the chance of the player's death. However, with every person you build a shelter for, you will get an extra life. To build those shelters you will need resources, and to get them you will need to plan and execute some good runs, all while escaping the tireless monsters. With more personnel will come more possibilities - base defense, scouts, manufacturing, etc. The game will always be focused on action, but everything you do in it will be highly meaningful, with huge consequences. I will write more about this soon - but, I hope this is enough to make the end game clear: Build an ark spaceship and escape Earth with fellow survivors. Of course, you might also lose all personnel, in which case it is gameover. Now, if we talk about the current prototype alpha version, the end game is rather simple: Reach a certain distance before the timer goes off. Because the environments are unpredictable, you must always improvise. This was very useful development-wise, because despite the randomness, I could balance the game to give specific results on average, given a constant skill involved. As the prototype reaches beta, I will work toward adding multiple stages with increasing difficulty. Having all that said, high score is not going to be set-aside. I would like to extract all challenges from the main game mode into separate, competitive ones. Cool concept. What platforms are planned for release? Also the link to the blog is a link to an image. Fixed the link, thanks! PC is the primary platform. I would like to have a version for mobile at some point, but for now it's being developed primarily for the PC. 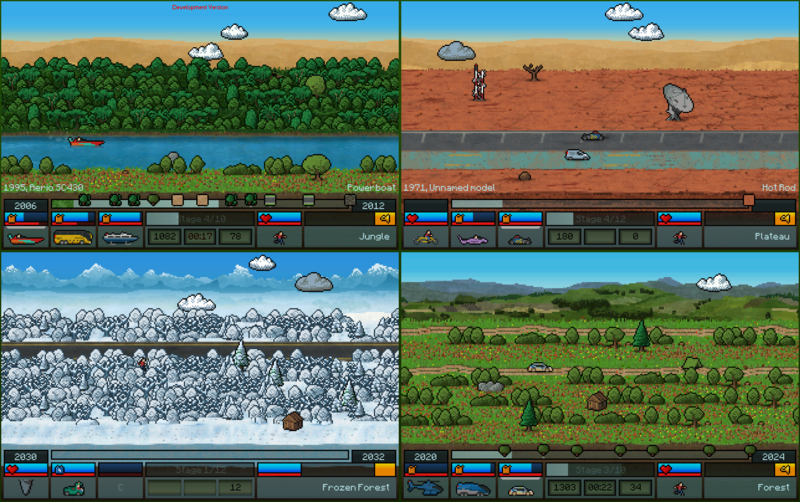 Current prototype can be run on Windows, Linux and Mac. I can't say with certainty about the final game yet. This definitely looks neat. I look forward to future updates! Hope you keep it crossplatform. Would you let us play the prototype at some point? Apologies for the lack of updates. I've been working on Switchcars almost non-stop meanwhile though, having various fixes done, new features and content added. In summary, during the last few months the game received solid interest from media/devs/players. I even won some awards! Really glad to see a lot of people like the game, and it's not even released yet! I submitted Switchcars to IndieCade and began aiming for an early release, with plans for additional features to be added through updates. This is something I would like to discuss here further in the following days. Most of the other stuff was described in more detail on my blog. Today I released a new trailer. 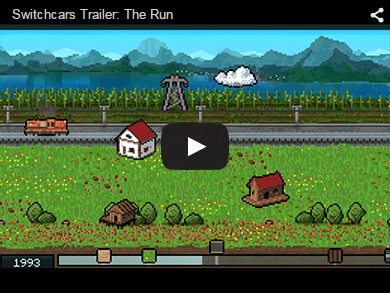 You can see the latest features and screenshots on the Switchcars Webpage. 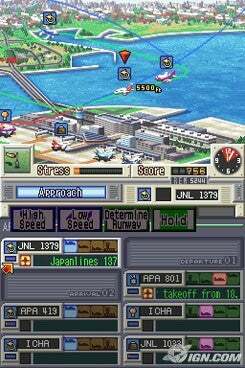 The graphics in this have a quality that reminds me of the "I am an Air Traffic Controller" series of games on the GBA through to the DS (One of my favourite games). Cool, I like how it looks indeed!